On the day of the first State of Origin game for 2015, it seems timely to reflect on Queensland’s recent economic performance relative to NSW. 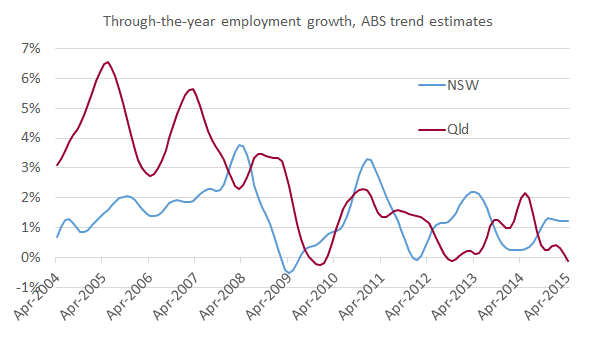 Alas, it has not been great, with Queensland actually recording a slight loss of jobs in the twelve months to April compared with positive (though not spectacular) growth in NSW (see chart above). Queensland’s unemployment rate is now 6.6% compared with NSW’s unemployment rate of 6.0% (see the Treasury information brief). The end of the mining boom undoubtedly caused a slowdown in the Queensland economy, the technical recession in the second half of 2014 that the Treasurer alerted us to last week (see More on Qld’s late-2014 technical recession). So it’s unsurprising that Queensland businesses are among the least confident in the nation, as reported in the Brisbane Times this morning. N.B. after originally posting this, I’ve corrected the post to say Queensland businesses are among the least confident in the nation, as business confidence is worse in South Australia. This entry was posted in Labour market, Macroeconomy and tagged employment, mining, nsw, qld, queensland, recession, stateoforigin. Bookmark the permalink.